Quotidian - Jill Ruth & Co.
ordinary; commonplace: paintings of no more than quotidian artistry. (of a fever, ague, etc.) characterized by paroxysms that recur daily. a quotidian fever or ague. Is that not a great word?! Did you know there was such a lovely and eloquent word for laundry? Kimmie from Art in Red Wagons hosts a blog party called "Tea on a Tuesday". Read about it here. It's a party to just visit, say "hey", and share your everyday. The quotidian. I say use that word to death, no one is gonna know the difference. I would be thinking, "look at her, making up her own words for things.. how cute"
This is one of my favorite words.Always has been.Some days I'm even grateful for those parts of everyday life. ;-D My day is going... the normal everyday fun that is the everyday! Such a fun word... and I think you can safely use it anywhere as nobody will know if it is misused of not!! ;) Coffee and laundry sounds very quotidian to me... though I only do laundry once a week!! that is quite the word!! happy tea on tuesday!! 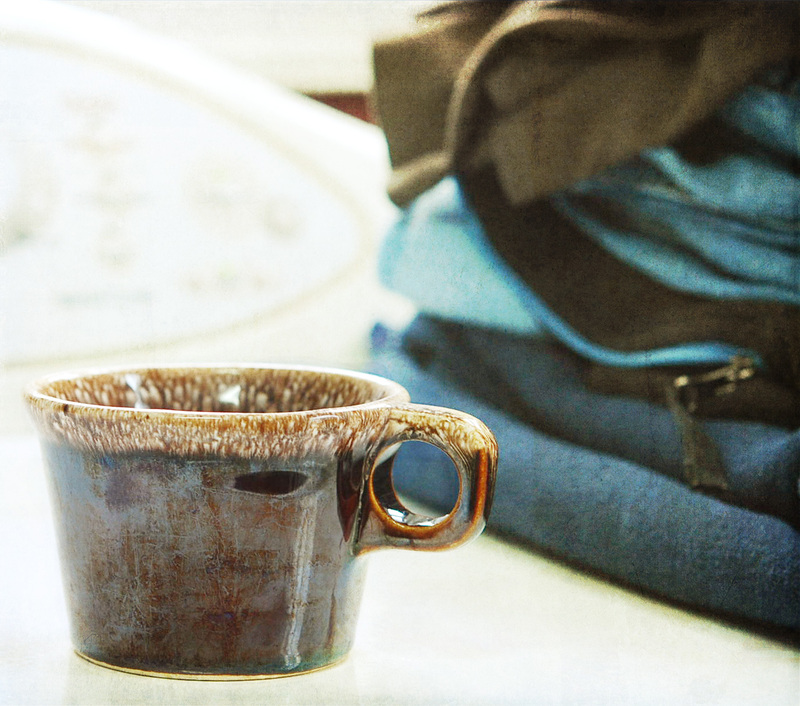 I think laundry and coffee go together perfectly. Doing laundry tends to make me so sleepy and a good shot of caffeine sounds perfect. Love that word - great for a new blog title!!! Hmmmm...Thanks for dropping by for tea and entering the giveaway!!! Yep, I like that word too. Use it, sistah. Own it. Are you sure it's not a person from the planet Quota? Reading it just makes me feel smarter...instead of just the same ol' same ol'! love the word - and around here it's tea with the laundry. My washer has been broken for a week (hard to get a repair man out here in the boonies!) I am actually beginning to MISS doing laundery and I can't believe I said that OUT LOUD. Actually, I am missing a steady supply of clean linens and clothing. I hate to impose on my in-laws too much (across the street). I will be celebrating when the repair man gets the part in this week. Might even have to blog about it! I'm happy you would join us today! Lovely post! Love the word :) it does lend laundry an air of importance. Happy T day to you. Awesome! I am not so good with vocabulary...I am the keeper of pointless knowledge though so I may catalog this one...or maybe not. Never can tell how my mind works these days. a new word ..love it! and your photo defines it so well.. me? off to work now ... my quotidian. Will the daily quotidian ever end?!! Jill you cracked us up today :) Love it....it makes laundry and the daily yulk stuff seem a bit more important with a fancy name! and that is one very inviting looking cuppa java! love the texture on the photo and the coffee cup! I couldn't help but notice how quotidian and custodian looked very similar! What is it with laundry? I've often said that it must reproduce when it's all hanging out in the hamper together! I wonder if we didn't have so much laundry if it would be able to reduce our need to consume so much coffee?! My first time joining in with the tea brigade - great word ! those concrete eggs were actually invented by me!!!!!!!!!!!!!!! in my blog you'll find the free tutorial! Awww...use your new word! It's so rarely used most people would have to look it up to know what you are talking about. LOL. Love your cup...brown stoneware has always held a soft spot in my heart.